Height 5 feet 10 inches. Weight 150 lbs. Chest measurement 34-36 inches. Complexion fair. Eyes grey. Hair brown. Sight and hearing both good. Colour vision correct. Limbs and chest well formed. Full movement of joints. Heart and lungs normal. Teeth fair. free from hernia, varicocele, varicose veins, haemorrhoids, inveterate or contagious skin disease. Not vaccinated. Good bodily and mental health. No slight defects. 17 August 1916 admitted to No. 2 Casualty Clearing Station (Rouen). 30 October 1916 admitted to 1st Australian Casualty Clearing Station, again sick. 13 June 1917 reported woundedin France. 12 October 1917 (2nd occasion) severely wounded in the right leg; admitted to the Military Hospital, Tooting. Progress was fair. Transferred to Convalescent Depot at Hornchurch on 8 December 1917. Later progressing favourably. 20 September 1918 admitted to the Military Hospital at Tidworth, suffering from influenza. Robert (Bob) Fraser Gillespie was born on 7 May 1896 at Amuri, Hanmer Springs, Canterbury. His parents were William and Ann (nee Fraser) Gillespie. Bob had four older siblings, Ida, Hugh (died aged 16yrs), Duncan and Catherine (Effie) and one younger George. When Bob was born the family lived at Upper Waiau Station where his father was manager. Bob began his schooling at the Upper Waiau Ferry School and continued at Central New Brighton from mid-1906, when his father purchased a dairy farm in Breezes Road, New Brighton. Bob enjoyed his school years, and he especially liked poetry and in later years wrote some of his own. He won numerous swimming medals while at New Brighton School. The races were held in the river not far from their Breezes Road home. The story goes that in one race Bob started heading the wrong way and on discovering his mistake turned around and still won the race. On leaving school Bob carried on the family tradition and became a shepherd in the South Canterbury area. Bob enlisted on 17 April 1915, the same day as his brother Duncan Thomas 6/2630. At the time of enlistment he was shepherding at Tripp Station, Orari Gorge, Woodbury. His employer was the Tripp Estate. He listed his father William, Breezes Road, Christchurch as next of kin. Robert was 5ft 10 inches tall and weighed 150lbs, complexion fair, eyes grey, hair brown, teeth fair. He attested at Trentham on 17 April 1915 ranked Private, joining the 2nd Battalion Canterbury Regiment. At the time of enlistment Robert would have been 18 years and 11months of age, but he had listed his birth year as 1895, instead of 1896. He had married Emily (nee Brown who came to NZ in 1913 on the ship ‘Ionic’ from Broseley in Shropshire) on the 9 of August 1915. Bob transferred to 2nd Battalion on 6 March 1917. He was appointed Lance Corporal on 18 March 1917. A few months later he was wounded in France on 13 June (at Messines?). He rejoined his unit on 21 June 1917 - his brother Duncan Thomas had been killed at Messines on 7 June. 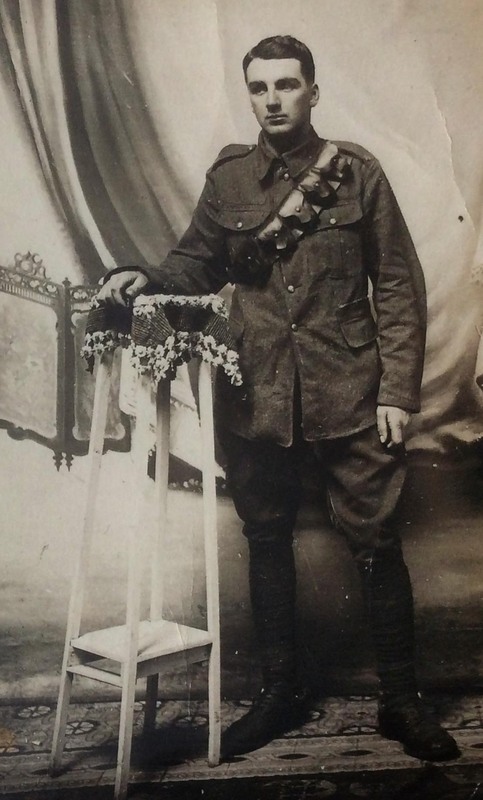 Robert was again wounded in action on 12 October 1917 at Passchendaele – a wound that ended of his active service. On 19 October Bob embarked for the Military hospital at Tooting Beck, London. After six months convalescing, on 9 April 1918, he was attached to the 3rd Reserve Battalion Canterbury Regiment at Sling camp. There he was a physical training and bayonet fight instructor until he returned to NZ on the troop ship No 275, SS Port Hacking, from Liverpool on 4 July 1919. He arrived in NZ on 20 August 1919 and was discharged on 17 September 1919 after 4 years and 7 days abroad. He was only 23 years of age. He received the 1914-15 Star, British War Medal and Victory Medal for his service. He is remembered on the Central New Brighton School Roll of Honour, along with his brother Duncan. The knee wound that saw the end of his active service, caused him to limp for the remainder of his life. Bob began work again at Tripp Station. His daughter Ida Catherine Fern was born while he was overseas and on return three more children arrived in quick succession: Dora Avery born 27 May 1920, Duncan William Arthur born 30 April 1921 and June Amelia Maisie born 12 June 1922. He had a small holding at Tripp Settlement and this children attended the Tripp Settlement School while he was still working for the Tripp Estate. He was for a time Chairman of the School Committee. Later he shifted to Albury Park, to work for Basil Shaw, a farm cadet who used to visit their home at Tripp Settlement. The family then moved to Rocky Point, Hakataramea, in the 1930s. Robert’s brother George had been at Rocky Point and then Haka Station. Robert and his brother were very close and when George moved to Balfour in 1938 to manage Ben Callum Station, he saw that a manager was required for Glenure Estate, Balfour. He told Robert to apply for the job, and hence the family moved to Balfour. The Glenure homestead was a lovely two storied wooden house with a verandah across the front with great views across the Waimea plains. They spent many happy years there. He was a member of the RSA, (President for many years), Lumsden Lodge (Grand Master), was a JP and a Captain in the Home Guard. He was also approached to stand for Parliament, but declined. When Glenure Estate was broken up for returned soldiers after the WWII he went to manage ‘Wilden’, near Herriot, then later moved to ‘Highbury’ near Ranfurly as manager. Bob was a keen follower of rugby and loved horse racing. While at Highbury the Didham stables at Wingatui would send their horses to be ridden on the hill country and Robert and Amy would take them back before the racing season began. Bob and Amy retired to 83 Ventry Street, Alexandra. Bob was a keen gardener. They made some great friends in Alexander, among them the Hobbs and the Marshalls and they enjoyed card evenings and both were very good lawn bowlers and competition took them all over the region. Their last residence was 23C Bringans Street and Amy lived there until her death in 1982. Bob had died on the 20th of January 1978 at the age of 81 years, after spending the last 2 years of his life in ‘Ripponburn’ Home, Cromwell. Bob’s grandchildren recall their grandfather as a lovely, kind and gentle man who loved life, his wife Amy (he called her Ma) and family dearly. He had a good sense of humour and he related really well to young people. He never spoke of his war experiences, but he did mention the Belgian mud - knee deep or worse in places. He carried in his wallet a letter written by his brother Duncan, who was killed in 1917.